A few weeks ago I had the joy of presenting a short paper on Praxis LIVE at the International Conference on Live Coding at McMaster University in Hamilton, Canada. While acting as an introduction to Praxis LIVE, the paper covered a few of the new features in v3 (finally released last week!). One of the highlights of the conference for me was Andrew Sorensen’s keynote on The Art and Science of Livecoding. Andrew’s Extempore programming environment and his thoughts on cyber-physical programming have partly influenced recent developments in Praxis LIVE (I say “partly” because this was already the direction of flow! 🙂 ) As someone long interested in the interactions between arts, science and technology, it was great to see examples of these ideas in use in fields like physics and astronomy as well as audio and video. Version 2 of Praxis LIVE brings in Processing as a core library, and adds a whole new OpenGL video pipeline with access to most of Processing’s features. Almost all of Praxis LIVE’s built-in components are now defined via the new live-code API, essentially as small sketches that can be defined and re-defined as your project is running. There are also a number of base components for creating completely custom components on-the-fly. Here we’ll explore how to use video:gl:p3d to translate Processing’s TextureCylinder example into a Praxis LIVE component. You can see this in action in the Smoky 3D example. 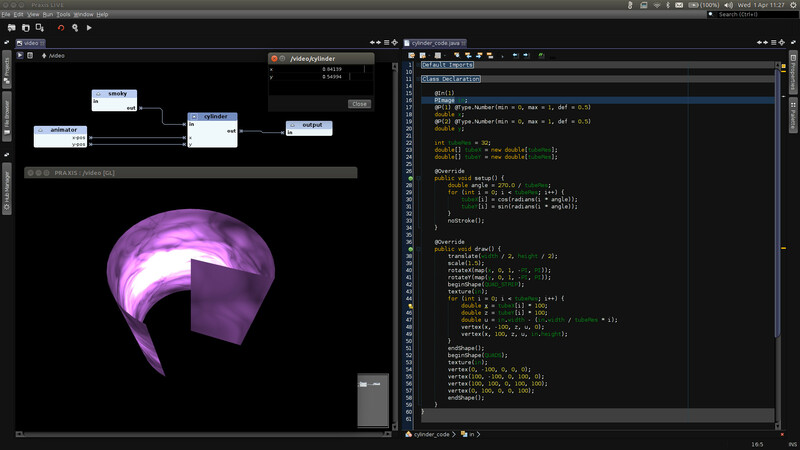 Smoky 3D example running with cylinder code open for editing. 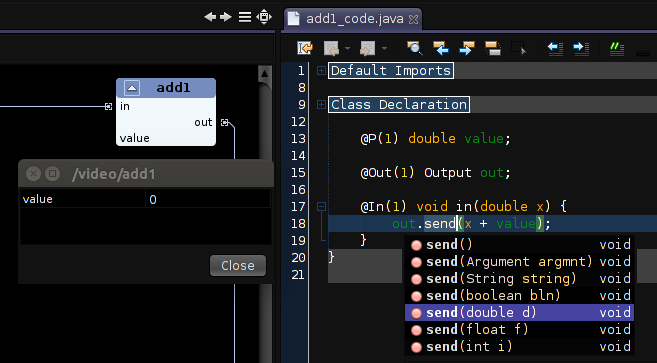 So, you’ve got a String property that’s a fragment of Java code, and you want to open and edit it within the NetBeans editor; you want access to code completion, hints, and all that NetBeans goodness; and, you want your String property to update every time you hit Save. Well, that was the challenge facing me in integrating the NetBeans editor into Praxis LIVE for version 2.
core:math:add component with code open for editing. So, after months of development (and not much blogging! ), Praxis LIVE v2 is finally released into the world. 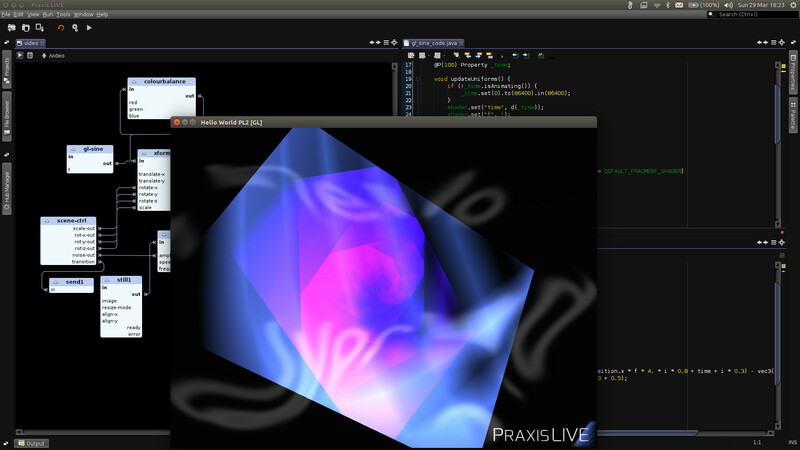 And after some radical changes in its underlying architecture, Praxis LIVE is now getting much closer to my original vision of a hybrid visual IDE for creative coding. Want to run a project across multiple computers on a local network? Want to code on one computer and have it inserted into a running pipeline on another? Want to run pipelines across multiple local processes (VMs) for better performance? The latest alpha release of Praxis LIVE v2 finally makes distributed hubs a reality (an idea that’s been around since the architecture was originally designed). 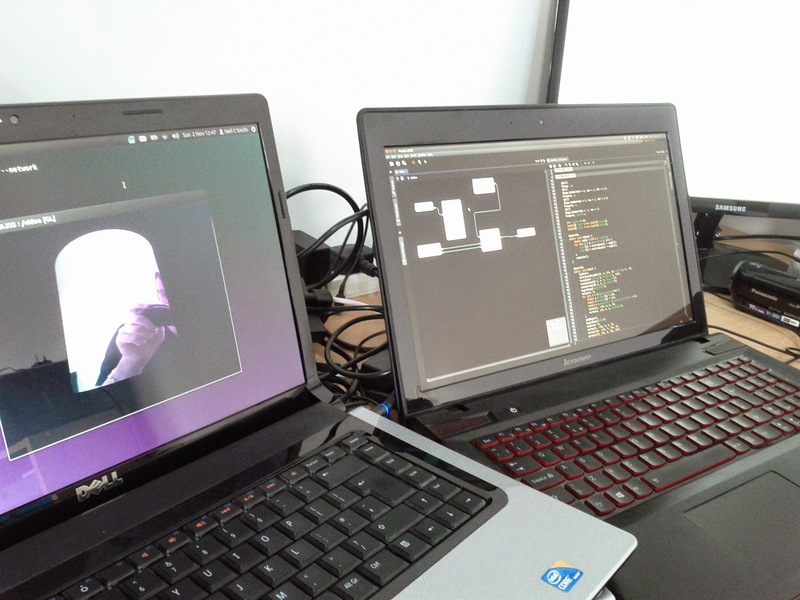 Live coding Java (Processing) & GLSL code on one laptop while it runs on another. Directly support Praxis LIVE development by sponsoring new features, or indirectly by commissioning us for custom projects, Java audio/video or NetBeans RCP work.